PLEASE help me write an even more hilarious one for flute players. Just click on the COMMENTS button below to add your own. 1. 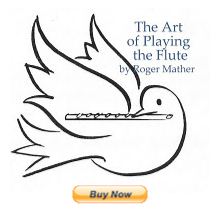 Choose the most challenging pieces in the flute repertoire, and change your mind often. Two days before the masterclass, ask everyone you meet whether you should play the Ibert, the Jolivet, or the contemporary piece with tape that your teacher has never heard you play before. 2. Give in to the impulse to appear as professional as possible: wear a strapless formal ball gown and arrive at least two hours early to see what everyone else is wearing. Swan around the hallways stopping each participant and asking whether "these shoes GO." 3. Tune onstage for at least five minutes. Go over to the piano and bang notes out, and suggest that the upper register is flatter than it should be. Ask whether another piano could be made available. 4. When the visiting master suggests you play a scale, narrow your eyes, and search for your teacher in the audience to visually confer that this master is an obvious idiot. 5. If the master tries to stop you to speak, keep playing. He really can't know your style until he hears your fabulous cadenza. 7. Practice an "air of superiority and defiance" while onstage, because you never know when someone at a Masterclass will spot you and make you a substantial cash offer to become a famous Conductor. 11. If the master teacher starts ambling off-topic, droning on about form or rhythm or something really boring, hint that they need to re-focus with a few sotto voce air-riffs on your flute, alternating with blasting the water out of it and shaking it. emphasis even argue a few points. 6. Bring 2 pieces to the stage and discuss loudly with your pianist which piece you should play, being sure to highlight all the negative reasons why not to play both. Hahahhahaa!! I really like "highlight the negative reasons why not to play both." 8. Begin your piece; vary your tempo unpredictably and glare repeatedly at your accompanist; as soon as you badly blow (literally!) a hard phrase, stop as though it was the accompanist's fault and insist on beginning again over the objections of the clinician.